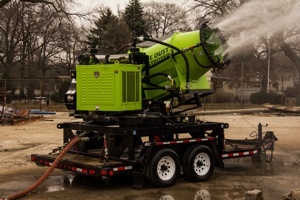 DUST CONTROL for demolition, scrap, mining, and aggregate industries. 8,500 Ft. per minute fan outlet air velocity. Oscillaator gives 30-360 degrees of movement. Electronically controlled aiming for oscillation function. 360 degrees of powered position adjustment. 1,000 ft (308M) line of sight radio remote control. 30,000+ CFM generated by 42 HP Fan.